Go to the official page to see pictures of the new characters. 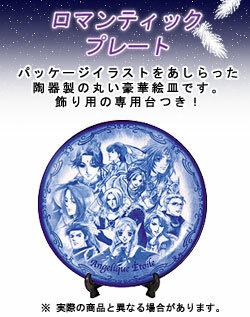 The cast for an Angelique TV series was announced at the 2005 Winter Neo-Romance Festa Live event! From the site- "To celebrate the anniversary of the first game and the overwhelming support of female fans for over ten years, Angelique becomes a long-awaited TV series! The cast will include all the wonderful voice actors for the series up until now and the characters are planned to debut with new costumes. Airing will begin in 2006. Please stay tuned for detailed information!" Go to the official page to see the latest developments. A Twin Collection DVD Box (KEBH-1072) will be on sale 2/23/05 for, 16,800 yen, with all eight parts on two DVDs. It's a limited edition set, but there's no information yet on what goodies it might contain. The Neo-Romance Event DVD Box (KEBH-1060) will contain 6 videos from Memoire 2000 through Neo-Romance Festa 3 and be on sale 2/2/05 for 14,700 yen. To celebrate the 10th anniversary of Angelique, Koei is turning the original Angelique game into a 3 part OVA. In part 1, the regular high school girl, Angelique, and honor student, Rosalia, are summoned to the Sanctuary as candidates to become the next queen. Waiting for the girls are the Queen's Aide Dia and nine Guardians. In the Queen Examination, Angelique and Rosalia must borrow the Guardians' power and cultivate the continent. To see more information, and downloads, click here. It's available for order from CDJapan and Amazon Japan. In celebration of 10 years of Angelique, Koei is publishing a limited edition "Angelique Sweet 10 Box", which is a set including a 200 page, all color artbook and 20 portraits with all new illustrations! It will be on sale in February 2005 for 15,750 yen. It's available for pre-order from Book One. And now available from Amazon Japan as well! New Lower Price for CDs and OVAs! A bunch of Angelique and Haruka CDs and OVAs will be joining the "Neo-Romance The Best" series of rereleases with a lower price. They will be introduced in two batches, one on 8/25, then another on 9/22. CDs will be 1,800 yen, and OVAs will be 2,800 yen. Angelique OVA1 Memoire of White Wings, and Haruka OVA1 Tale of the Hydrangea Dream will be out on 8/25. Angelique OVA2 From the Sanctuary With Love will be out on 9/22. Angelique Etoile is being ported to the Playstation 2. On sale 9/16. The regular version will be 6,800 yen, and the Premium Box will be 8,800 yen and will include a special CD with messages from the cast, a scarf, and a special greeting card set. Angelique Etoile will be on sale 12/19/03. The regular version is 8,800 yen, and the Premium Box version (with a "romantic plate") is 10,800 yen. It should work fine on WinXP or Win2k with Japanese support installed. You can preorder it from Himeya. A preview in Etoile Prologue revealed 3 new characters, and that Angelique Collet is finally going to have Guardians of her own. Are these guys, along with Victor, Sei-Lan, Timka, Ernst, and Mel, her new Guardians? For screenshots from the preview, see the Angelique Visual Archive. The "legendary etoile (French for star)" chosen to save the cosmos of the sacred beast... that's you. One day, a letter comes to you. "Yoohoo! Celestia, which is on the verge of opening, is in a big pinch! Do something with your "legendary power", please!" It was from the Queen's Aide Rachel, who brought you to the cosmos of the sacred beast. She wants your help in order to safely open an entertainment park, "Celestia", being constucted on the floating continent Arcadia. You hear the story from the worried looking Guardians, and at last the story begins! The tutors and collaborators gather to try to help you too. With their cooperation, can you make "Celestia" have a spectacular opening!? Click here and here for more info. A DVD Box for Angelique OVA2 "From the Sanctuary With Love" will be on sale 1/1/03 for 14,800 yen (KEBH-1031/2). It will have all 3 episodes and the Special Video on 2 DVDs. It will have similar extras to the OVA1 DVD Box, including a CG gallery, scene selection, character profiles, and character and art materials collections. Also included will be an all-color 36 page booklet, and a stationary set in a special clear case consisting of a desktop label set with mini calendar, a mini notebook with stickers, and a postcard set. The newest OVA was announced at the Neo-Romance Festa2 in Osaka. Called "Angelique Twin Collection", it will total 8 volumes (4,700 yen each), each featuring 2 characters, hence the name. Each volume is comprised of 2 music clips (one by each voice actor), an animation drama (which continues over all 8 volumes), and comments from the voice actors. Koei is porting 2 Angelique games to Gameboy Advance. One is the original Angelique (SNES), and the other is Fushigi no Kuni no Angelique (Angelique in Wonderland), a board-game version. Both games are 5,800 yen each, to be released on March 21 and March 8 respectively. There is also a petition to bring Angelique for GBA to America. Go sign now! For more information on the games, see below. The Gemme Stories Official Album is the memorial book for the Gemme Stories series which is made up of a comic, the 2nd OVA, and the drama CD series Gaiden 4. It's scheduled for release on February 7 for 1,900 yen. Koei will be releasing a limited edition Angelique White Wing Memoire (Shiroi Tsubasa no Memoire) DVD Box on December 5 for 12,000 yen. It will be 2 DVDs. Disc 1 will have both parts of White Wing Memoire, and disc 2 will have the "Making Of", plus various extras, including a CG gallery, scene selection, character profiles, and character and art materials collections. Also included will be an all-color B6 size (5"x7") 36 page booklet with an introduction to the characters and story, a short story, and comments from the voice actors and creators, plus a special full-color 48 page writing pad, envelopes, and gold seals, all in a special case illustrated by Yura Kairi. Gamecity is selling high-quality prints of Angelique art signed by Yura Kairi. Fine jewelry with motifs inspired by Angelique characters created by Rubipa De July, a designer brand under the supervision of Ruby Party.